Not everyone has a diffuser in every room of their house. Me included. I sure wish I did though! But it’s a pretty unrealistic idea for me at the current moment. I mean, diffusers, at least the good ones, aren’t cheap. But there is a way you can still use the essential oils to freshen up those spaces. With five kids, my bathrooms are always in a state of chaos. For some reason my kids don’t know how to flush the toilet. But at least when I do my daily walk throughs and “toilet checks” aka me walking around the house just to flush toilets, I can spritz some of this natural DIY air freshener, or “poo-pourri” as some like to call it. You can basically choose any scents you want. I like these because they are fresh and clean. 10-15 drops Essential Oil(s) of your choice. 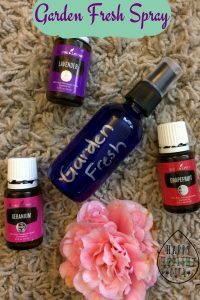 I wanted to share with you some of my personal favorite recipes for these natural DIY air fresheners. I also use this in their closets and spritz their clothes every once in a while. And there is always a bottle of this Natural DIY Air Freshener in the van because you never know when someone will leave that half eaten sandwich in the back which ends up under the seat (not me). Or when someone will change a dirty diaper but instead of walking it to the trash they put it under the drivers seat and forget about it (not me). Or when someone will go grocery shopping and leave a plastic bag with ground turkey in it and not realize it until the van starts smelling (Ok, this one was me). 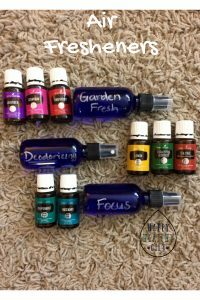 You may be wondering why I would go through the “trouble” to make my own air freshener when there are some already made, super cheap (less than a dollar) air fresheners on the market. If you have been following my blog for any length of time you will know that I’m passionate about removing harmful chemicals from my home. And these premade air fresheners that are so easily available are FULL of toxic chemicals. How do you think those amazing scents are made? Not taken directly from nature, like essential oils are, that’s for sure. They are synthetic. They are what gives so many of you headaches. WHY OH WHY would you want to breathe all of that in and let all of that land on your skin? The essential oils are a super safe, natural option. And, as you can see by my instructions, these natural DIY air fresheners that I make are super duper easy to make. Have you made your own air fresheners before? If so I would love if you could share your favorite recipe(s) here! Don’t forget you can learn more about Essential Oils here and if you want to get your Premium Starter Kit you can do that here. The kit has a lot of the oils used in the recipes above (plus more!). And when you use the link provided to sign up you get help and resources so that you can get the most use out of your oils.